El Nido is a popular tourist destination in the Philippines, especially the archipelago of Bacuit which is considered one of the most beautiful bays in the world. Join a boat tour in El Nido to hop around the Bacuit Archipelago. You will sail through the lagoon with turquoise waters flanked by emerald karst cliffs, then kayak to secluded powdery white beaches. With an area of 923.26 km2 (356.47 sq mi) El Nido is a 1st class municipality in the province of Palawan. 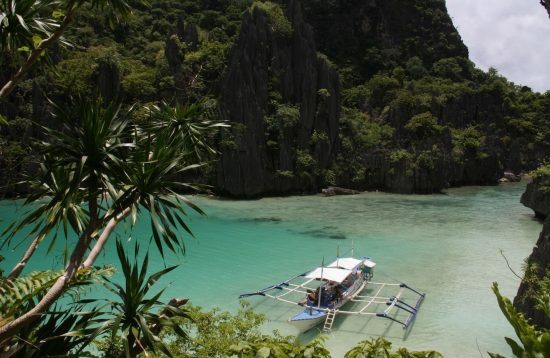 It’s also the most popular tourist destination in Palawan. The population of El Nido the 2015 census was 41,606. The original settlers of El Nido were the Tagbanwas and Cuyunons. Throughout the centuries, there has been a constant migration of Tagalogs, Hiligaynon, Bicolanos, Ilocanos, Chinese and Spaniards. El Nido Airport also known as Lio Airport is the primary and sole airport serving the town of El Nido. There are daily shuttle vans that run from El Nido to Puerto Princesa. Fast Ferries operates a daily route between Coron and El Nido, with a sailing duration of around 3 hours and 30 minutes. There are a couple of banks in El Nido. It’s possible to withdraw cash from the ATM machine at the BPI Bank near the port. All the high-end and medium-sized hotels accept credit cards, while smaller hotels/pensions and shops accept only cash. Many hotels in El Nido provide free wireless internet, but sometimes connection is really slow. The Philippines has the slowest internet in the Asia Pacific. The average length-of-stay in El Nido is 5 days. The Big Lagoon: it’s is a must-see place. The crystal clear warm waters of this lagoon provide the perfect setting for a unique swimming experience. Small Lagoon: this incredibly beautiful lagoon is accessible through a gap between two giant limestone rocks. Small Lagoon’s crystal-clear waters are encircled by jagged limestone cliffs dotted with trees. Secret Beach: it’s a pocket of white beach that is concealed by limestone cliffs and is only accessible through a narrow crevice. 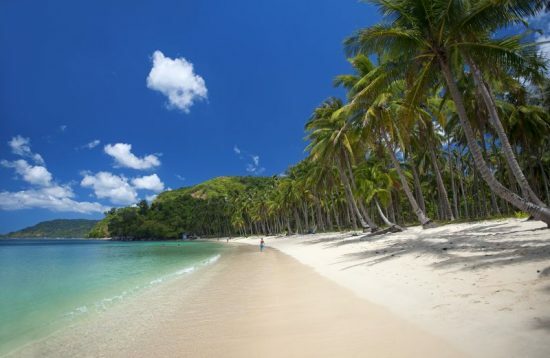 Cadlao Island: the largest island of Bacuit Bay known for its white sandy beaches and its hidden lagoon, offering one of the best spots to enjoy the bay without the crowds. 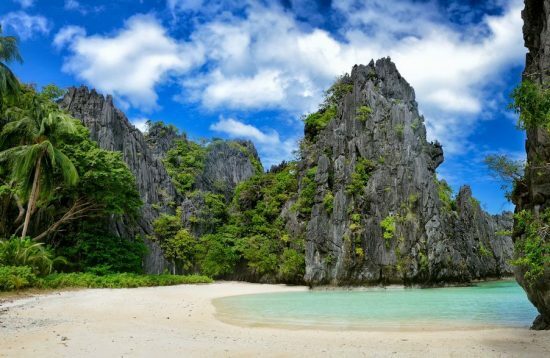 El Nido can be visited all year round. If you travel during the wet season, from June to September, you may encounter some short bursts of heavy rainfall and strong wind. The bad weather may last for a few days. El Nido is rarely in the direct path of the typhoons. -Public Transportation: There are several shuttle van companies that offer a direct link between Puerto Princesa and El Nido Corong Corong Terminal. Shuttle vans are daily and run almost every hour from 6.00am until 6.00pm. The journey from Puerto Princesa to El Nido usually take around 5-6 hours. -Private Transfer: Private van is the quickest and least hassle way to get from Puerto Princesa to El Nido. -Flight: Air Swift operates a direct flight to El Nido via Puerto Princesa. The flight takes less than one hour and the airplane directly lands to the Lio Airport which is 4 kilometers away from El Nido downtown. -Fast Ferry: There are a couple of Fast ferry companies that operate daily sailing from Coron to El Nido and vice versa. The crossing takes approximately 3 hour and 30 minutes / 4 hours. -Public Transportation: It’s possible to travel by shuttle van from Sabang to El Nido although there is no a direct link. Lexxus operates a shuttle van service from Sabang to Salvation Junction to connect with the shuttle van going from Puerto Princesa to El Nido. The journey from Sabang to El Nido usually take around 5-6 hours, plus the stop in Salvation. -Private Transfer: Private van is the quickest and least hassle way to get from Sabang to El Nido. -Flight: Air Swift operates a direct flight to El Nido via Manila, Boracay, and Cebu. -Public Transportation: Shuttle vans from Port Barton to El Nido are daily and run two times per day. The journey from Port Barton to El Nido usually take around 4 hours. 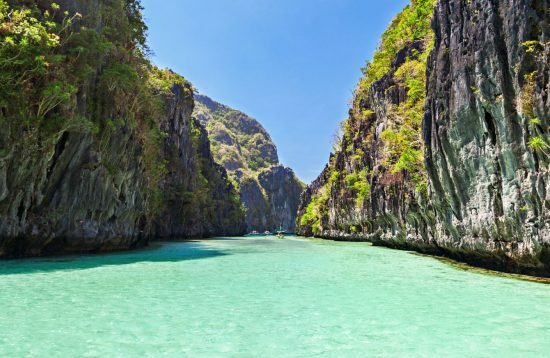 The tour package 7-Day El Nido & Coron Adventure starts from El Nido, and include the visit of the most beautiful islands of the two popular tourist destinations. If you wish to visit the Underground River, you can combine it with a tour in Puerto Princesa. Budget-mid priced hotels and resorts in El Nido town are the perfect base to explore the islands of Bacuit Bay and the beaches on the mainland. However, El Nido town is often packed with tourists during the high season. El Nido’s most exclusive resorts are located on the islands of Bacuit Bay. El Nido Resorts is a group of elite resorts, all of them located on private tropical islands. This group of resorts that is composed of Miniloc Island Resort, Lagen Island Resort, and Pangulasian Island Resort, ranks among the most exclusive properties in the Philippines offering absolute discretion and world-class service (of course, prices that will be higher than other resorts). The resorts located in Corong Corong beach, Lio Beach and Las Cabanas Beach are perfect for escaping the crows of El Nido and provide the perfect combination of islands exploration and relaxing days on the beach. There are only basic accommodation in Duli Beach and Nacpan Beach. Department of Environment and Natural Resources (DENR) has decided to conduct preventive measures in order to prevent El Nido’s waters from being contaminated. All establishments that are located less than 30 meters from the shoreline must carry out renovation work in order to comply with the new rules and regulations. DENR has also banned all the combination tours (Combo A&C A&B etc.) and Party Boats in El Nido. This new policy has been implemented to help minimize the negative impact of tourism in El Nido. 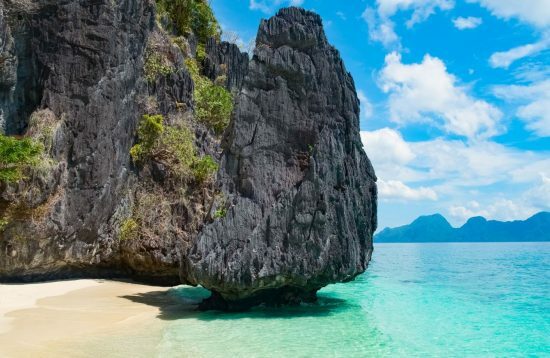 Because of this, many tourists are alarmed and are worried about a possible total closure of El Nido for environmental rehabilitation (like Boracay). As per today, the news about the total closure of El Nido are just rumors and there isn’t any official confirmation on this.